KeraPro | hair, there and everywhere! It’s been a while since I have written a product review … mainly since I use the same products over and over again. 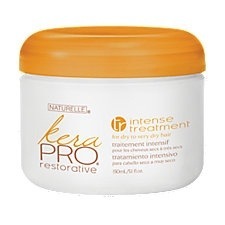 I bought KeraPRO Restorative Intense Treatment for Dry to Very Dry Hair at Sally’s yesterday. I have seen other bloggers rave about it and thought that since it was $5, I would give it a try. I used it as my steam treatment yesterday. I applied it after I got out of the shower and combed it through. I sat under the dryer with my turban and shower cap for 40 minutes, then rinsed and followed up with my Roux Porosity Control. My hair felt so silky after I rinsed it out! It was easy to detangle as well. After I took out the rollers, my hair looked amazing. Seriously, it was like I had a fresh perm!! It was very silky and bouncy! In my opinion, it does what it claims!! This product will now be a staple in my routine. 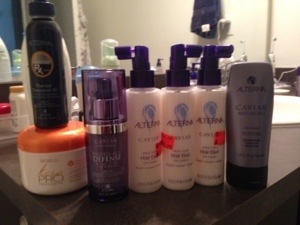 I think I will rotate it with the Silk Elements MegaSilk deep conditioner! I am heading back to Sally’s this week to buy some more while it is on sale for $5! This product gets an A!